We are very excited to announce that we will be joined for our Book Club episode by Mr. Julian Dibbell, author of My Tiny Life, one of the first works to explore the social dynamics of online worlds, game-oriented and otherwise. We will discuss the book as well as current topics of Mr. Dibbell’s interest (which may or may not include discussion of his book Play Money, Chinese gold farming, Scientology, or any number of other subjects). If you have questions about My Tiny Life post them in the comments here or send them to @firstwallrebate on Twitter. We will address as many interesting questions as we can during the podcast. Get your questions posted or sent by October 20. We’ll record on that day and get it posted as soon as possible afterward. My Tiny Life is available from LuLu.com as a purchase or free-to-download PDF. If you would like to get the paper experience without all the paper, then you could check out the Google Book Search version. In 1998 Julian Dibbell published My Tiny Life and altered the way we would think and write about videogames. His investigation into online worlds defined a new type of virtual ethnography, and has spawned volumes of discussion and debate. But beyond creating fodder for digital culture and game studies classrooms of the future, Dibbell’s book remains one of the most entertaining reads one can find. He covers the nerdy, the perverse, and the heartwrenching, and profoundly reminds us how much the imaginary stuff matters. My Tiny Life is the story of Dibbell’s experiences as he tries to live his life in and around the virtual realities of early text-based Multi-User Dungeons (MUDs) and the people who made those spaces. These are not exactly games, although games take place within them. And they are not simulations, although simulations have been built inside them. These worlds are an in-between, existing both as corporate experiments and grassroots underground. Dibbell’s strength is how he binds together these and many more dichotomies, creating work that is both analytical and emotive, existing somewhere between anthropological study and personal memoir. In 2008 Dibbell managed to do what most writers only dream of: He wrestled his book from the hands of his original publisher (who had let it go out of print) and gave his book to the masses by releasing it free (with a few caveats). This is fortunate for us because My Tiny Life is available in a variety of ways. 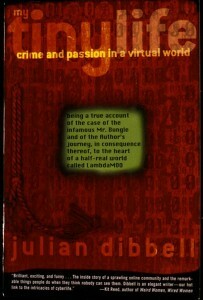 Of course, there is a lot to be said for the dead-tree version, and Dibbell offers that medium via LuLu.com. Also available via LuLu is a free-to-download PDF version. If you would like to get the paper experience without all the paper, then you could check out the Google Book Search version. We invite you to join us in reading, or re-reading, Julian Dibbell’s My Tiny Life over the next several weeks.